Koligo Therapeutics issued the following announcement on Aug. 22. KYSLECEL is made from a patient's own pancreatic islets – the cells that make insulin to regulate blood sugar. KYSLECEL is intended to preserve insulin secretory capacity in chronic or acute recurrent pancreatitis patients after total pancreatectomy (TP-IAT). KYSLECEL is a minimally-manipulated autologous cell-based product regulated by the FDA solely under section 361 of the PHS Act and 21 CFR Part 1271. TP-IAT is an important treatment option for eligible patients that suffer from chronic or acute recurrent pancreatitis. TP-IAT can significantly reduce pain and the need for opioids, and improve quality of life, for patients with chronic or acute recurrent pancreatitis. The KYSLECEL launch dramatically increases patient access to TP-IAT. Until now, TP-IAT could only be performed at a handful of hospitals with access to specialized laboratories. Qualified hospitals who do not have the requisite processing capabilities are now able to perform TP-IAT without incurring the risk, expense and uncertainty of establishing in-house laboratories. Importantly, patients are now able to undergo TP-IAT locally at a qualified center. KYSLECEL may be covered by commercial health insurance, most Medicaid carriers, and Veterans Affairs. Patients must check with their physician and insurance provider for eligibility. FDA pre-market approval for minimally-manipulated cell-based products like KYSLECEL is not required. KYSLECEL is produced and distributed according to FDA's current good tissue practices (cGTP) and in compliance with applicable federal and state regulations. KYSLECEL is not routinely tested for transmissible infectious diseases. TP-IAT, whether or not performed using KYSLECEL, is a major surgery that carries significant risks including bleeding during surgery, portal vein thrombosis, and inflammatory reactions. Review the KYSLECEL Instructions for Use prior to treatment for important additional information and discuss your treatment options with your physician. To make KYSLECEL, the surgeon at a qualified hospital removes the diseased pancreas and sends it to Koligo's FDA-registered facility in Louisville. Koligo isolates the pancreatic islets to make KYSLECEL. Koligo ships KYSLECEL back for re-infusion into the liver, where the islets are intended to engraft and produce insulin. Matthew Lehman, Koligo CEO: "In recent months, Koligo has delivered KYSLECEL for 12 patients at select centers. We are delighted to now offer the product across the Eastern United States. KYSLECEL addresses a major clinical need for patients suffering from debilitating pancreatitis pain by improving access to TP-IAT. TP-IAT often leads to profound patient improvements in pain and quality of life, and to significant reductions in the need for opioids. Our goal is to make TP-IAT available to all eligible patients across the U.S.
"Currently, the labeled shelf life of KYSLECEL is six hours from the time it leaves Koligo's facility in Louisville. This allows for delivery to most metropolitan areas in the Eastern U.S. Ongoing product development is expected to extend the shelf life of KYSLECEL and expand access nationwide by 2019. "We are also encouraged by the interest shown in KYSLECEL outside of the United States. After completing our development work to extend the KYSLECEL shelf life, we will work on potential partnerships that may allow access to TP-IAT in several regions globally." Matthew Lehman, CEO, is an experienced biotech executive. He previously served as CEO of Prima Biomed [ASX:PRR (now IMM) andNASDAQ :PBMD (now IMMP)]. Balamurugan Appakalai is a world leader in islet biology having completed islet isolations from over 800 human pancreases. Stuart Williams is an internationally recognized expert in regenerative medicine. He has extensive experience translating cell-based therapies to human clinical use and 24 has issued US patents. Mike Hughes is a transplant surgeon who established the clinical islet program in Louisville and has conducted more than 30 TP-IAT procedures. Koligo Therapeutics, Inc. is a regenerative medicine company dedicated to the commercialization and development of transformative cell therapies for pancreatic diseases. 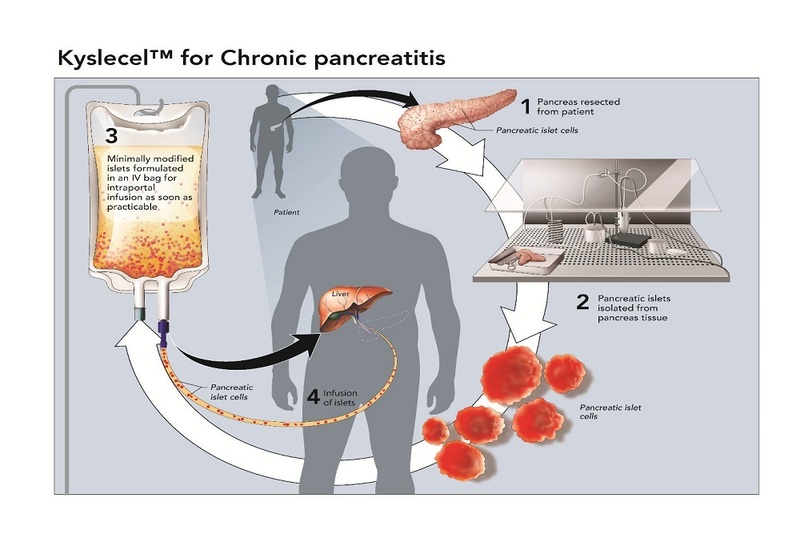 Koligo's principal commercial product is KYSLECEL™ for chronic and acute recurrent pancreatitis. Koligo's technology platform aims to improve cell and tissue transplant in multiple therapeutic areas including through the use of 3D bioprinting. Koligo is based in Louisville, Kentucky. For more information visit www.koligo.net. Want to get notified whenever we write about Koligo Therapeutics ? Next time we write about Koligo Therapeutics, we'll email you a link to the story. You may edit your settings or unsubscribe at any time.